I recently was followed on Twitter by Rootflage, and, being a blonde, I was intrigued by their product description: "Battle of the roots. But this time, you win!" "If you are anything like me you are constantly battling your roots. You pay an arm and a leg to have your hair highlighted and your roots grow out so quickly! The last week before your next highlight you feel like you need a hat to hide your unsightly roots. However there is an answer to your war on roots! 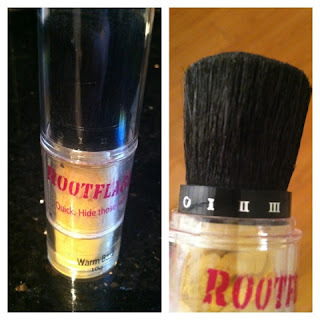 Rootflage will camouflage your roots to subtly blend them in with your highlights. 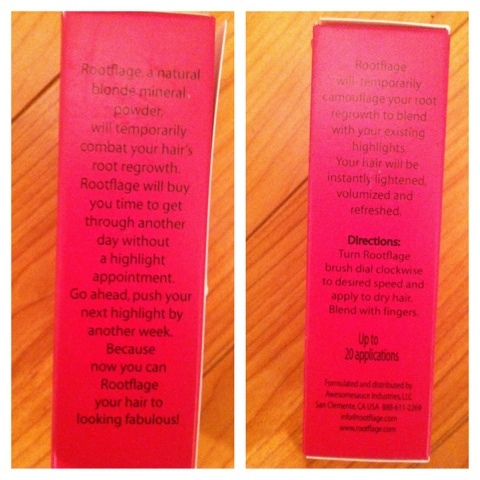 Rootflage will buy you time to get you through another day without a highlight appointment or dye job. Rootflage will temporarily touch up your roots. Go ahead, push back your next hair appointment by another week. Because now you can Rootflage your hair to looking fabulous." A product that would help me win the battle that I keep losing with my roots? Count me in! Rootflage uses a natural blonde mineral powder (think dry shampoo...only better) to temporarily cover hair regrowth in between coloring/highlighting. It washes out easily each time you shampoo and can be reapplied as often as you wish. I contacted Rootflage and they kindly sent me a review kit to try. I happened to receive it after a weekend at the beach. After leaving early Sunday morning for the 4 hour drive home without washing my hair, my roots were definitely making themselves known by the time I got home! 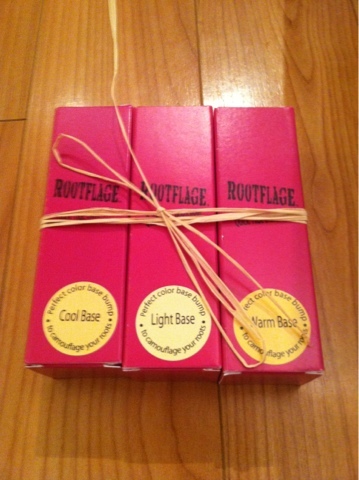 Rootflage comes in three different tones, Light, Cool and Warm. I decided to try Warm as it seemed to match my hair color best. As the directions state, I turned the Rootflage dial to my desired "speed." I started out at the highest "speed" but realized quickly I only needed to set it to O or I. I prefer to control the amount applied myself by pushing it against my roots numerous times. A little bit goes a long way! I decided to try it out on the darkest part of my roots to really put it to the test...under the many vast layers of hair on the side of my head. I really feel like the before photo below does not do my roots justice as they are more dark than they appear here, but as you can see in the "after" photo, Rootflage completely hid the roots and gave me a gorgeous, warm blonde color immediately! I was honestly shocked as I did not think it would work that well or be that easy. 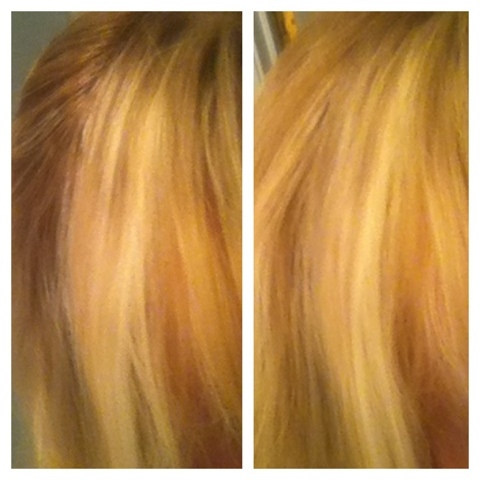 I thought it would slightly lessen the darkness of the roots, but it really made them look blonde! I was hooked from first application! I tried it again on the other side of my head where the roots seemed even darker and still, Rootflage delivered! I've experimented with Light and Cool and have been just as impressed. I am definitely a fan now! Easy peasy! Check out more photos and info on Rootflage's Facebook page. Want to try it for yourself? One lucky reader of TheBlondeBlogger.com will receive a 3-pack of Rootflage in Light, Cool and Warm...a $60 value! I also have an exclusive 25% coupon code for you to use! Simply enter "blondebloggersentme" at checkout to receive 25% off your total Rootflage purchase (offer expires August 31, 2013)! To enter the giveaway, simply leave a comment on this post stating why you'd like to win, then follow the instructions on the Rafflecopter widget below to complete your entry. There are bonus methods for entry as stated on the Rafflecopter widget. Entry deadline is 12:00 am on Wednesday, June 19, 2013. By entering, you automatically agree to all the rules and disclaimers listed here. Please also see my disclosure policy here. 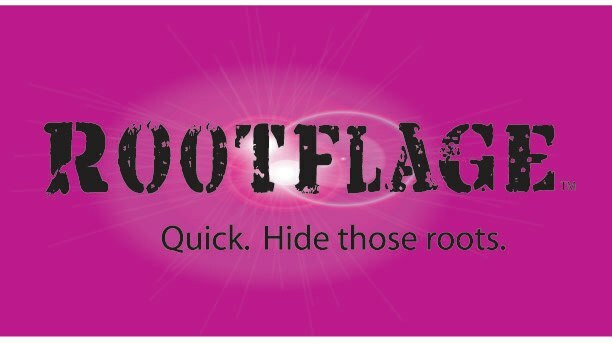 Disclosure: I received a complimentary 3-pack of Rootflage to facilitate this review, but as always, opinions expressed are all my own and are not influenced by complimentary products and/or payment. I would actually like to win this for my Mom. She colors her hair but her gray roots still spring up and she absolutely hates them! I've never heard of anything like it! Sounds really interesting and I'd like to give it a try. I love mineral makeup its so light and natural, especially for the summer,Id love to try a new one! I would love to win this for my mom's birthday! Momma needs a little help with the roots, especially as I go a little too long in between colors, and it would be nice to use when I am out and about. I have used mineral makeup in the past and it is about the only thing I like wearing now. It doesn't make me breakout and it looks great on my face! Would love to win more products to try different brands/kinds! This product seems like a godsend. Sometimes, between work and school,it's difficult to find time for a hair appointment every few weeks. I've tried other, DIY solutions for roots, but they do not seem to work for me. I would love to try this product! I'd love to give this a try. 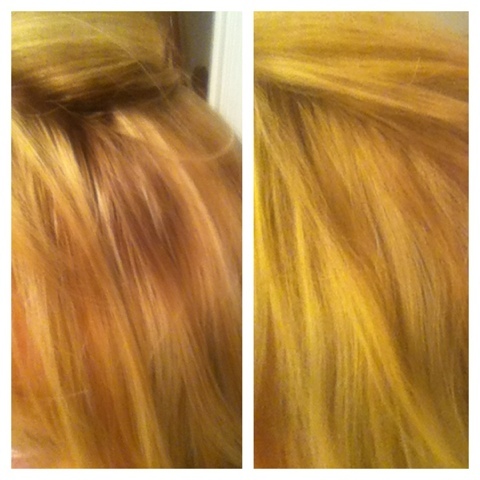 I hate seeing my roots grow out. I would like to win because this would be great between colorings! Can I post your post to my website? I will add a link to your forum. That's one very sweet post.